As women, I’m sure we’ve all walked away with a cosmetics purchase that we don’t end up really using because it’s not the right fit. At Merle Norman Cosmetics, Wigs, and Day Spa in Lacey they take the guesswork out of cosmetic shopping for you. With 15 different kinds of foundation alone, there really is something for everyone and the amazing staff will help you find it. “It doesn’t do us any good if someone comes in and buys everything in this store, if they don’t know how to use it. The products will sit in a drawer,” store owner Madelin White explains to me. With a very low-pressure environment and great customer service, it’s easy to feel comfortable here. Cosmetics manager Natasha Beale says she is happy to take all the time her clients need whether that’s 20 minutes or three hours. 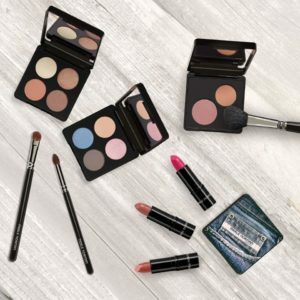 “When you come in, it’s a great time to try out products you don’t normally wear because you’ll know if you like it before you even go home with it.” But if you’re still not sure on something, she is more than happy to send you off with a sample. She says sometimes it’s good to try a product in the light of your home or office or just see how it wears in your daily life. It’s this personal one-on-one service that is hard to find anywhere else. With over 40 years of experience, Madelin knows how to treat her customers right and so does her staff. However, both she and Natasha say the important thing to do is speak up. When assisting customer, both women say they can only help you based on the information you share. “We can introduce these things, but in the long run it’s going to be based on a customer’s comfort level. That’s also why we try different things on you,” says Madelin. 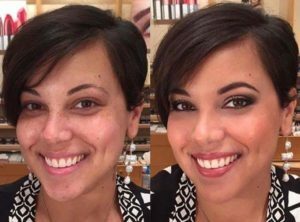 Often the two women say people will come in with a picture of the makeup they want to try on themselves, similar to asking for a celebrity hair cut with a stylist. This can be a very helpful tool to getting the look you want and the right products to get there. I personally can’t help but notice Natasha’s amazing eyelashes, which she says are false lashes she puts on everyday. When I need my next bottle of foundation or some new eye colors for the season, I will definitely schedule an appointment at Merle Norman Cosmetics, Wigs, and Day Spa. Don’t forget to check out their three awesome hair dressers & massage therapist! They also have a full line of wigs and hair pieces.